The 23rd annual Boast the Coast event will take place on Saturday, October 6, 2018. Boast the Coast was conceived in 1996 to showcase Lewes’ nautical heritage and to feature activities that complemented the already long-established University of Delaware’s annual “Coast Day” event. Coast Day takes place on their Lewes campus on Pilottown Road the first Sunday in October with Boast the Coast always the day before. Last year was the first year the Friends of the Canalfront Park hosted an Oktoberfest from 2 – 6 p.m. on Boast the Coast Day and it returns again this year. The Cape Water Tours vessel, Discovery, will have two, one hour-long cruises at 11 am and 12:30 pm guided by the Lewes Historical Society, leaving from City Dock. The children’s activities in 1812 Park also return while the Seafood Tasting is taking place from 11 – 2 pm. Free deck tours of the H.R. SPIES will take place on City Dock, also from 11 am – 2 pm. The SPIES is the Flagship of the Philadelphia District Army Corps of Engineers and replace the SHUMAN which was their flagship for 46 years. The SPIES was built in Bellingham Washington State by All American Marine and delivered to the Corps though the Panama Canal by ship. The SPIES is a 68 foot foil-assisted catamaran. Its area of operation on the coast extends from Manasquan, NJ to Ocean City, MD. The “Treasured Tales & Lore Tour” on the Cape Water Tour vessel are SOLD OUT. The annual Lewes Merchants’ Fall Sidewalk Sale has long been associated with Boast the Coast. It is a three day event, wrapped around Saturday’s Boast the Coast events, beginning on Friday, October 5 through Sunday, October 7 from 10 am to 5 pm. There will be a number of free tours available on Boast the Coast day including at the Lewes History Museum under the auspices of the Lewes Historical Society (LHS), located on Adams Avenue in the Margaret H. Rollins Community Center, as well as two other LHS museums - their maritime history museum in the historic Cannonball House on Front Street and their Life Saving Station. The Lightship Overfalls, located a little further down Front Street, adjacent to the Society’s Life Saving Station on the canal, will also be open for free tours on Saturday, October 6. In 1812 Park, there will be free activities for children and their families including nautically-themed face painting by Catherine Flaherty and balloon art by Chuckles the Clown. Concurrently, event goers can purchase their lunch at a Seafood Tasting by participating Lewes Chamber restaurant members Irish Eyes (an Admiral Level Sponsor) and Jerry’s Seafood. The Friends of the Canalfront Park are again bringing Bavaria to Lewes from 2 – 6 p.m. on Boast the Coast Day. Under the tent, there will be German music and dancers, great food from local restaurants and of course, Dogfish Head draft beer. General Admission Tickets to the Oktoberfest Tent are $25 .Tickets can be purchased online (www.LewesCanalfrontPark.org) and at the Lewes Chamber of Commerce Visitor Center in the historic Fisher-Martin House in Zwaanendael Park next to the Zwaanendael Museum – cash or check only. It is a rain or shine event. 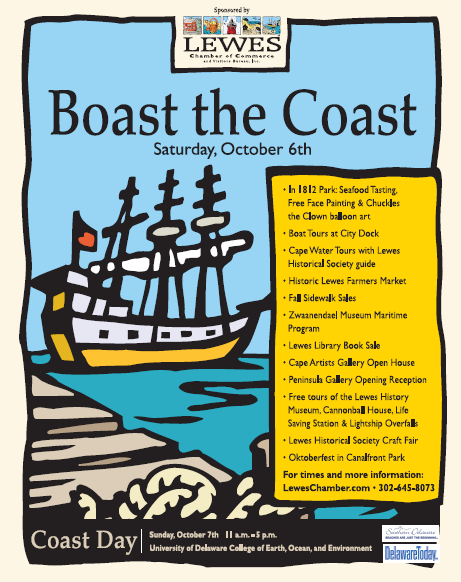 Other events associated with Boast the Coast day are: the Historic Lewes Farmers Market in George H. P. Smith Park from 8 a.m. to Noon; the Zwaanendael Museum’s Maritime Program; the Lewes Library Book Sale from 9 a.m. – 3 p.m. at 111 Adams Avenue; the Lewes Historical Society’s Craft Fair from 9 a.m. to 4 p.m. on its campus at the end of Second Street at Shipcarpenter Street; the Cape Artists’ Open House at their Third Street Gallery from 10 a.m. to 5 p.m. with light refreshments and the Peninsula Galley’s Opening Reception, “Interpretation,” featuring Howard Eberle, Steve Rogers & Richard Calvo, from 5-7 pm at 520 E. Savannah Road.